I see this as a solid answer to an important question: How should you fill your brain? Or, more specifically, who should you trust to teach you things? What makes a learning source worthy of your attention? And, how much of what that source communicates should you incorporate into your own life? These questions can be thought of within the context of an idea I had a while ago, which I like to call the “Stuff that Works” library. Your brain, among the sea of all other brains, holds a library of “stuff that works” – a unique mixture of facts and concepts that you know, and processes, advice, and patterns that work for you. It’s unique from anyone else’s, because you expose yourself to a unique set of learning sources – and you’ve also got a unique set of your own goals, dreams, problems, limitations, relationships, environment, etc. As a content creator, this actually takes some pressure off my shoulders. I’m allowed to be imperfect as a teacher – and in turn, you can learn from me even though I’m not perfect. Even if I can never achieve an output that is 100% true, correct, and useful for you, there will most likely be something that you’ll find helpful. This puts a bit of responsibility on you as the learner. It means you can learn from anyone, which means that you should look for the logic and objective truth in a statement, rather than judging it on the merits of the person who said it. Logos, not ethos. Looking for More Learning Tips? 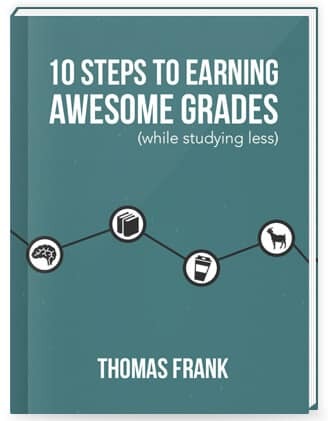 This concept first showed up in my book 10 Steps to Earning Awesome Grades (While Studying Less), and I decided to flesh it out in this video. If you’d like even more tips on learning and improving your academic performance, you might like the book – it’s also free! So – is this concept similar to how you think about learning? Do you tend to believe you can learn from any source, or do you feel that some should be shunned altogether? How do you judge the sources you do learn from?